The best Free Video Converter of the year 2018 that saves your time. Now it is an app that transcodes or in other words converts one video format to another. And there are a lot of video formats. But we may say that MP4 is the most popular video format today. Free Video Converter by DVDVideoSoft is aimed to convert video files to any format compatible with popular multimedia devices. So, if you come across with a rare, that isn't recognized by your iPad, or Xbox One, transform it to the most commonly used. This Video Converter creates video files for any modern device, like Apple iPad or iPhone, Samsung phones and tablets, Amazone Kindle, Android and others. Why may you need to convert videos from one format to another? This is usually done in cases where a target device does not support the format or has limited storage capacity that mandates a reduced file size or to convert incompatible or obsolete data to a better-supported or modern format. 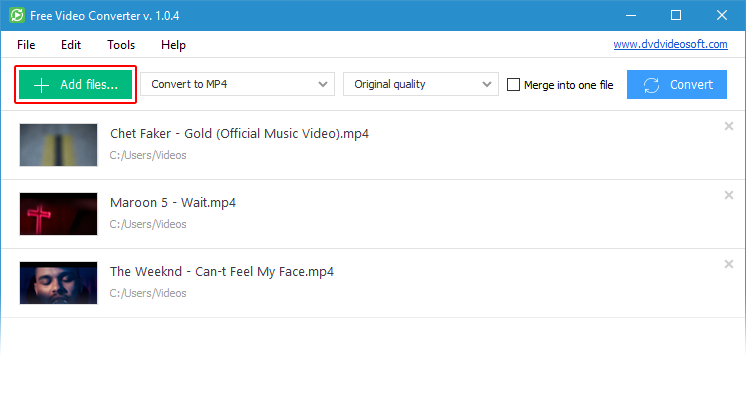 Convert AVI to MP4, WMV to MP4, MOV to MP4 or a heck of a lot of other formats to MP4. Supported video inputs: MP4, M4V, AVI, MOV, MKV, WMV, 3GP, FLV, IVF, DIV, DIVX, MPG, MPEG, MPE, WEBM, ASF, QT, MTS, M2T, M2TS, MOD, TOD, VRO, DAT, 3GP2, 3GPP, 3G2, DVR-MS, F4V, AMV, RM, RMM, RV, RMVB, OGV, TS, any 4K video, etc. If you seek for compatibility with obsolete devices convert MP4 to AVI or MPEG4. How to convert video or how to change video format to MP4? Start by downloading and installing Free Video Converter. Next run it and add your files to this video converter. Select output format: MP4, AVI or MPEG. Click 'Convert'. Now let the conversion complete. Stop spending hours trying to get hard-to-understand video codecs. Leave it to DVDVideoSoft geeks. The DVDVideoSoft team designed simple and self-explaining interface to convert videos between lots of formats and change video quality to fit the storage space of any device. To convert videos or change a format to MP4 you need to make just three steps. 1. Click the 'Add files...' button to add video files. Select one or several video files to convert. 2. Choose output format or device in the drop-down menu. It's easy. We offer just a few options to playback on any device. Wait till the video converter completes the process. That's it, your video is ready! Find out how to convert YouTube to MP3 or just download YouTube video. Also try Free Video Editor and Free Audio Converter. Comparison of video converters on Wikipedia.